Nine monks from Jittapawan Temple chant before being treated to a lunchtime meal. 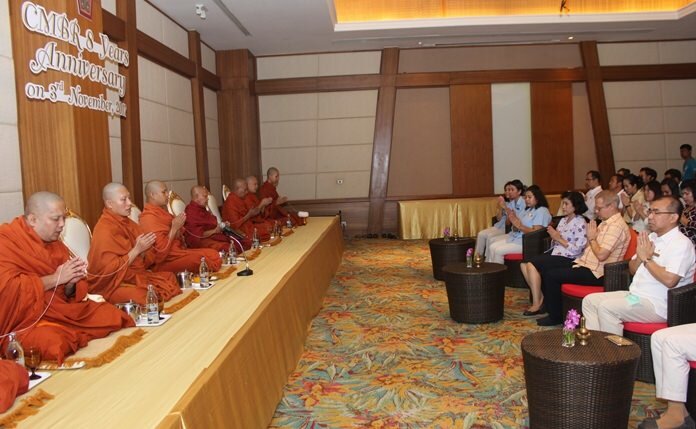 The Centara Grand Mirage Beach Resort Pattaya celebrated its eighth anniversary with two Buddhist ceremonies. General Manager Andre Brulhart presided over the Nov. 3 event at the Naklua resort’s rooftop shrine. Employees paid respect to the hotel’s new royal Garuda, then moved to the lobby to pray the Brahma god there. General Manager Andre Brulhart lights candles and incense during religious ceremonies marking the hotel’s 8th anniversary. Alms were offered to nine monks from Nongaor Temple and, later in the morning, nine monks from Jittapawan Temple chanted before partaking in a lunchtime meal. The Centara Grand Mirage was born out of the renovation of the Central Wong Amat hotel in 2009 on Naklua Soi 18 and built upon 44 rai of beachfront. It was redone with a “Lost World” theme, harkening back to the lush world of the Jurassic Park movies. The resort consists of 555 rooms with a private water park. Many activities take place on a monthly basis and there are regular parties, celebrations and weddings. The hotel is fully equipped, with fitness rooms, spas, spacious meeting rooms and more. For diners, the resort offers some of the finest beachfront restaurants and grill rooms, like the Acqua, the Coast Beach Bar & Grill and the Zulu Bar. The soft opening of the Centara Grand Mirage Beach Resort Pattaya took place on Nov. 3, 2009, which today the hotel marks as its anniversary.